The trail tops out near 11,000 feet so is not rideable because of snow from sometime in October to sometime in May depending on how much snow the area gets. The South Boundary Trail #164 is one of the very best trails in the southwest! It includes ribbons of singletrack through some of the prettiest aspen stands around. What makes the South Boundary Trail #164 truly unique is the backcountry nature of riding it. Unlike similar high-altitude trails, you are not going to pass houses, ski lifts, resorts, etc. It is a genuine backcountry experience and is absolutely awesome. The problem with backcountry adventures is that you can get lost, not have enough food, and it can be a bad idea to do them yourself. With this in mind, Zia Rides is hosting the South Boundary BigRide from Angel Fire Resort to Taos. The event will be fully supported with a well-marked course and aid stations along the way. There will be a shuttle option as well. Do one of the best trails anywhere as part of a fully supported event. This is a high alpine trail that hits nearly 11,000 feet. It is remote and pretty inaccessible. Be prepared with food, jackets, etc. Storms can come in during afternoons in the summer dropping the temp 30 degrees. Be prepared! Starting at Angel Fire Resort, go four miles south on the highway to Forest Rd. 76. Take a right on Forest Rd. 76 and begin the climb through meadows, aspens, and pines. After 3.5 miles, take a right on Forest Moto Trail 70 - a well-marked doubletrack. There will be an aid station at this turn. Take Moto Trail 70 two miles to Osha Pass - be sure to look off to your right because the views are stunning at Osha Pass. Hang a hard left onto Elliot Barker - a hard-to-see singletrack in the trees. Take Elliot Barker - which goes back and forth between singletrack and doubletrack three miles to the South Boundary Trail #164. Elliot Barker has some steep pitches but is a fairly gradual option with beautiful views off to your left. When you reach the South Boundary Trail #164, after about three miles, turn right and begin the last grunt of a climb on a rocky doubletrack to the top. At the top, you are rewarded with great views and a rocky doubletrack descent. The singletrack a little way down marks the beginning of "Heaven on Earth" - an aptly named descent that sends you smiling all the way down ribbons of singletrack through pines and aspen corridors. It's awesome, seriously awesome! The last mile of this section is a gradual climb on a doubletrack to Garcia Park - a beautiful high alpine meadow where there will be an aid station. Take a quick left on Forest Rd 437, then, after a couple hundred yards, take the South Boundary Trail #164 again on your right. From here, you gradually climb about two miles up Sierra de Don Fernando to an area called "Paradise" - an apt description. If you have time, ride the little trail up to the top for full views to the west. From Paradise, the trail starts heading downhill all the way to Taos, and it is awesome. You'll be on the South Boundary Trail #164 for the next seven miles - super-fun singletrack through aspen groves. The last mile or so of this section is a little more technical, so watch your speed. After a log jump/drop, you'll hit a doubletrack. 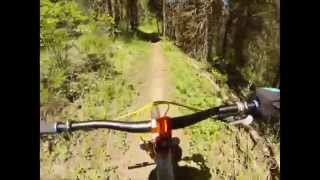 You'll want to hang a left onto this doubletrack - this is Ojitos Trail. There will be a small aid station at this junction. Ojitos follows the contours south for about a mile or so before it really starts heading downhill in full force. Ojitos is another trail to watch your speed on, as there are some tricky sections. The last couple miles of Ojitos is a blast with about 40 berms along the way. Just watch yourself, as you still have to be careful. Think twice before jumping! The trail eventually comes out at a water tank. Keep heading down along the south side of the road. Head across at the crosswalk, and turn left. The Taos Youth and Family Center is the big building right in front of you as you head west. Congrats, you just finished a seriously amazing ride! The South Boundary Trail uses routes that have likely been there for hundreds of years and were used by the inhabitants of Taos Pueblo. There is a ton of history in the area, and this trail is no different. Awesome high forest riding on Elliot Barker. The view back toward Angel Fire on Elliott Barker. Trail 164 sign on the climb up Osha Mountain. Fun jumps at the end!